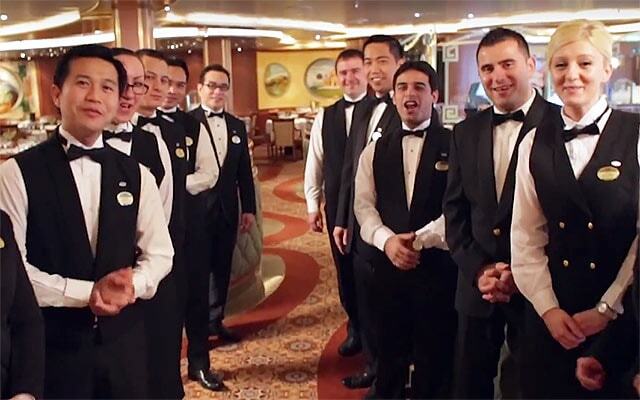 Not sure what to expect while working onboard a cruise ship? A career at sea affords you many unparalleled opportunities such as travelling to exotic locations, building meaningful friendships with diverse co-workers onboard, and gaining valuable professional skills in a world-class environment. Unlike careers on land, however, life at sea has some unique conditions. Princess Cruises takes great pride in our efforts to make the adjustment to sea life as easy as possible so you can focus on being The Consummate Host for our guests. With over 30,000 sea-going employees and a growing fleet of ships, it takes a great deal of coordination and strategic planning to keep operations running smoothly. Because of this, contract lengths vary based on a number of factors. Our contract lengths vary from 4 months (most senior officer positions) to 9 months. Because of the nature of the environment, space is utilized very efficiently onboard. Most ranks onboard share accommodations with other sea-going staff in rooms that include a TV, phone, writing desk, and limited storage space. There are several dedicated cafeterias (referred to as the Crew Mess, Staff Mess, and Officers Mess) with a variety of menu items from different regions of the world. Since the ships are in operation each day, you will be scheduled to work every day during your contract. We understand that after working long hours, it can be challenging to unwind. To help, we have a robust program of recreational and social activities in our Crew Welfare program to help you relax and enjoy your experience at sea! Have questions? Please take a look at our Frequently Asked Questions page for more detailed information. Here at Princess, we understand how challenging it can be for our crew to work away from home for such substantial periods of time. Therefore, as a company we strive to give you all the necessary resources and comforts that enable you to be The Consummate Host for our guests. Recreation rooms dedicated to crew member activities which include a DVD library, bicycle rentals (for port days), Wii video games, and a general lounge area. Princess offers other travel-related benefits to employees, supplementary and extended leave, plus reimbursement of certain visa expenditures. In addition to the standard 45-60 day leave that all employees receive, the company offers supplementary leave alternatives based on the needs of qualifying individuals. Our extended leave program is offered exclusively for crew members with at least five years of continuous service. There is no guaranteed entitlement to an extended leave. The company will reimburse visa expenditures to the extent any such visa (except for the crew member’s first C1/D) is needed for the crew member to travel to/from the ship in accordance to MLC 2006 regulations. Princess reimburses domestic airport baggage fees for up to two bags. Excess baggage fees beyond airline restrictions are the responsibility of the crew member. In the event that your baggage is lost en route to a ship or returning home from a ship, Princess has robust policies in place to provide you with assistance until your baggage can be recovered.